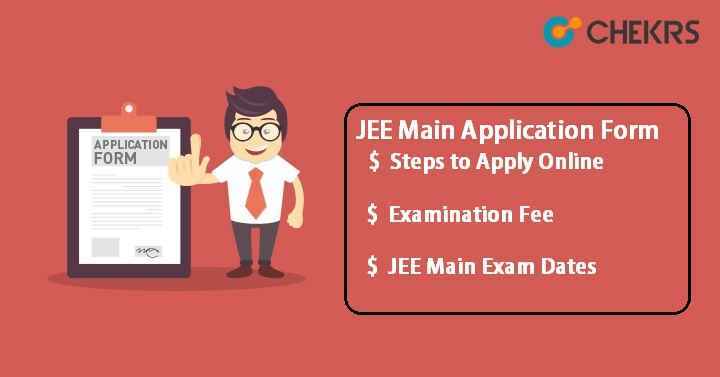 JEE Main Application Form 2019: Joint Entrance Examination (JEE) is a national level examination conducted for students who want to take admission in the field of engineering. It has been formed by two separate examinations – JEE Main 2019 and JEE Advanced. To get admission into various IITs, NITs, CFTIs and other engineering colleges of the country students have to qualify both JEE Main & JEE Advanced exam. JEE Main Registration will start from the month of December. Interested and Eligible candidates can apply for the JEE Main 2019. Indian citizen/PIOs/OCIs/NRI and Foreign national candidates can apply for JEE Main. Should be born on or after 01.10.1993 for General/OBC candidates. For SC/ST/ PWD Categories, 5 years relaxation in age. Candidates who will appear in the 12th or equivalent exam in 2019 can apply for JEE Main. 2018 Passed out candidates can also apply for the same. Diploma Holders or final year student of Diploma will be eligible for this exam. Note: For more detail information about JEE 2019 Eligibility Criteria, candidates can check here. Click on the link activated for “Apply for JEE (Main) – 2019”. It will redirect to next page. Again click on “Apply for JEE (Main) – 2019”. Read all the instructions carefully and then tick on Declaration checkbox. Click on “Proceed to Apply Online”. Aadhaar Card authentication page will appear on the screen, enter all the required details according to your ID proof or Aadhar card. Click on “I Agree” checkbox and then click on “Submit” button. Keep all the necessary documents together while filling the application form. Fill the application form in the given order Exam details, Personal details, Academic details, Contact details, Parent’s / Guardians details. Set password, security question with answer and enter the security pin and then click on “Next” button. A pop-up will appear on the screen to review the page. Candidates can click on either “Edit Application Form” or “Submit” as per their requirement. At last verify mobile no. & Mail Id by entering the code sent to the candidate’s registered mail id or mobile no. Next process is to upload the images like Photograph, Signature & Thumb impression. Click on “Upload scanned Images” button. Photo must be clicked with name & date of taking also. Photo should be clicked without hat/caps/goggles but spectacles will be allowed. Signature & thumb impression should be taken on white paper. Check the detail information about the size and dimension of images to be uploaded in the table given below. After uploading images, candidates must pay the fee before the last date. Click on “Go for Fee Payment”. Payment can be done through payment gateway (Debit card/ Credit card/Paytm/SBI Buddy Mobile wallet) or e-challan in any of bank Syndicate/Canara/ICICI bank. Select the option for payment as per your choice. Click on button “Proceed for Payment”, after completion of transactions, it will show a message on the screen. For e-challan, take the print of generated e-challan from the website and submit it to the nearest branch of specified banks. After payment process, choose examination date & slot for online mode examination. At last, take the print of Application form for future use. To print the form, Click on the “Print Acknowledgement Page”. Tags:JEE Main 2019, JEE Main Application Form, jee mains eligibility, jee mains exam date, jeemain.nic.in.